From the Archive: A British Television Blog: Elementary My Dear Santa Claus, It's Sherlock Holmes! Elementary My Dear Santa Claus, It's Sherlock Holmes! I always have time for Sherlock Holmes and luckily he exists in many different styles. If I want to see him fight Nazis during World War II, I’ll just take a look at some of the Basil Rathbone Universal films. If I want to see a really modern and very cool take on the character, I will look at the very stylish version created by Steven Moffat and Mark Gatiss, Sherlock. If I want to see a very traditional telling of a Holmes’ story, I have a lot of choices. 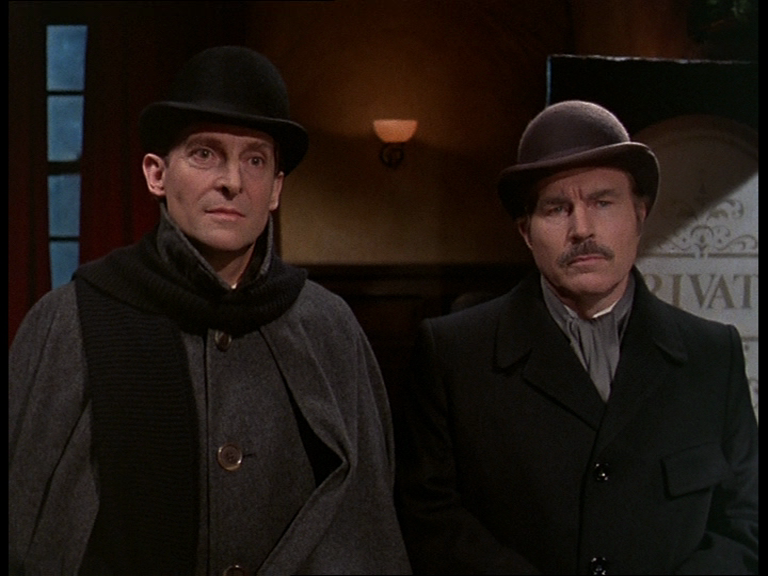 There are generally three versions of the character I watch when I want to watch a traditional Holmes’ story: Douglas Wilmer, Peter Cushing or Jeremy Brett. I know there are a variety of others who played the role and very well but these three are among my absolute favourites. Though for me, ultimately it will always be Jeremy Brett. The others feel like a great re-telling of the story, the Jeremy Brett Granada version of the series feels like I am entering into their world. As I continue on going through series in December that have a Christmas theme to it, don’t be put off by the air date of this episode. It is certainly a Christmas episode. It may have aired originally in June of 1984; it was certainly still a very enjoyable in December of 2011. This episode begins with two seemingly separate storylines. 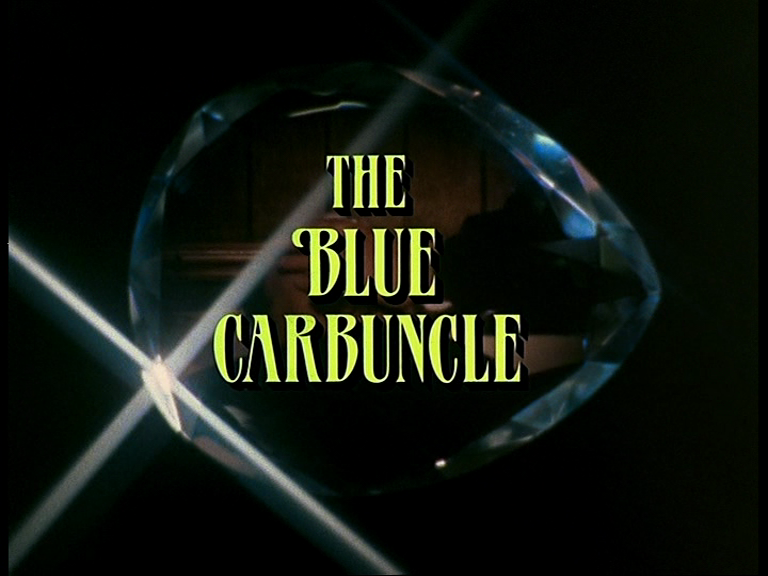 The first is about a jewel, The Blue Carbuncle, which is stolen from the hotel room of Countess of Morcar. The second one is the case Sherlock Holmes takes on which is a near random act of violence to an elderly man who ends up dropping a bowler hat and a goose he was going to cook at Christmas. Local commissionaire Peterson was on the scene when it happened and when he blew his whistle, everyone ran away including the old man. Holmes tells Peterson to go ahead and take the goose home but leave the hat. It is later that Peterson will return with some startling news. Meanwhile, as Countess of Morcar is devastated by the disappearance of the jewel an arrest is made of the plumber in the hotel doing work at the time of the robbery. John Horner who had a previous record is arrested for the disappearance of the jewel. When Horner says he has no idea where the jewel is, a reward is set up for £1000 for its return. Truly a king’s ransom. Peterson returns to Holmes and Watson and produces a blue jewel that was inside the goose which was left behind in the street the previous night. Just reading about the theft of the jewel and the reward in the paper, Holmes knows the jewel he has is the Blue Carbuncle. Holmes holds on to the jewel from Peterson and he himself puts a notice in the paper trying to coax out the man who had the goose the previous night. The next day, Holmes and Watson gets a visitor by the name of Henry Baker. Baker only bought the goose that night through a special program at his local where a little bit of money is put away all through the year and at the end of the year, they get a goose. It is clear that Baker has no idea about the jewel. He doesn’t ask for one and is quite satisfied just to get any goose for Christmas dinner. This sets Holmes in motion. He goes to the pub where Baker got the goose and is able to track down where the landlord got his geese from. This leads Holmes and Watson to Covent Garden where they meet a man named Breckinridge. Breckinridge is immediately angry at Holmes because Breckinridge is sick and tired of people coming up to him to ask where he got his geese from. 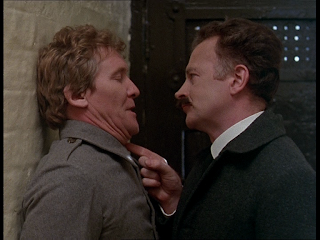 Holmes tricks Breckinridge into giving him the information they need. It looks like for Holmes to get to the bottom of the case, he will need to go way out to Brixton. Luckily this will not be necessary. Just as Holmes and Watson are about to leave Covent Garden, another man goes over to Breckinridge to ask about the geese. This is James Ryder. Holmes and Watson go over to Ryder and start to question him and eventually take him back to 221b Baker Street. Back at Holmes’ house they get to the bottom of what had happened. Ryder and one other person, Catherine Cusack, were employed by the Countess of Morcar. They stole the jewel and framed Henry Baker. Ryder, who knew the police were going to search the hotel the Countess was staying at, took the jewel to his sister’s place. His sister Maggie Oakshott raised geese for the holidays. Ryder made one of the geese swallow the jewel and later took that one. Little did he realize that he took the wrong one and was frantically searching for the right one ever since. Ryder is nearly frantic himself for stealing the jewel. He regrets ever getting involved with the scheme and pleads to Holmes for forgiveness. Because it was Christmas, Holmes was very kind and told Ryder to leave. Leave the continent and Holmes will not mention his name to the police. John Horner gets released from prison back to his family. Merry Christmas! Sherlock Holmes first appeared in print in 1887 written by Sir Arthur Conan Doyle. 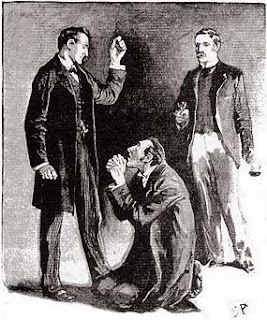 Holmes’ first novel appeared in Beeton’s Christmas Annual in 1887. The annual was printed between 1860 and 1898. 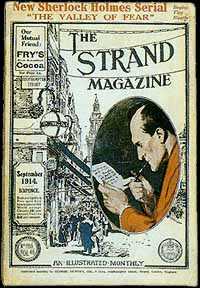 The short stories detailing the cases of Sherlock Holmes appeared in Strand Magazine. Strand Magazine ran from 1891 through to 1950 running at 711 issues. It seemed like a long time to me because it overlapped between the end of the 19th century and the start of the 20th but that is only 59 years. Time Magazine has been running for 88 years and is not showing signs of slowing down. 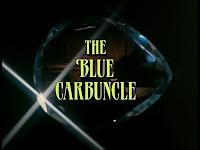 Although the Granada series are generally considered to be the most faithful adaptations of the Arthur Conan Doyle stories, this episode has one piece that is a little different from The Adventure of the Blue Carbuncle. 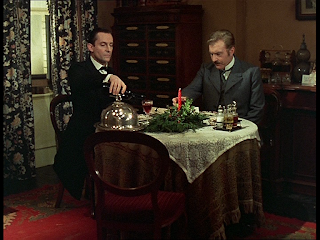 In the episode, when Ryder flees the continent it appears that Holmes is going to keep the jewel and not give it back to the Countess. Instead he tells Watson that he will keep it for his museum. Not only does the Countess not get the jewel back but Peterson will be neglected of his reward! In the story, Holmes sends a note to the Countess alerting her that he has the missing jewel. What I love about the Holmes stories is that for most of the stories, it is set during the Victorian era. This of course is referenced to Queen Victoria as head of the British Empire. This era began when she was crowned in 1837 until her death in 1901. Her reign is the longest in British history lasting for over 63 years. Recreating the Victorian era for these stories is one of the best things about this series. As I said at the top of this article, this series actually invites you into the world of December 1890 which is when this series is set. If you watch this series, pay close attention to the sound design. There is always some kind of background noise going on that sells the setting. A great example of this is when Holmes and Watson go out to Covent Garden to track down Breckinridge. Not only are there tons of extras acting not only as buyers and sellers but everyone is yelling something out. Their yelling to sell their goods, there are horses trotting down cobbled streets making wonderful sounds. I love those sound! My eyes get so excited by what it sees I have to re-watch scenes once in a while because there is so much happening. This is not by any means a criticism; I love watching this and picking up on new details I have not seen before. Even Baker Street was a full scale set which was constructed at Granada Studios in Quay Street Manchester. That’s more great detail! This series succeeds on both sides of the camera. Starting off by adapting Sir Arthur Conan Doyle’s original work is a great start but bringing in John Hawkesworth is what gets my attention. When I see something with John Hawkesworth’s name on it, I will make time to check it out. Hawkesworth, along with John Whitney re-worked Eileen Atkins and Jean Marsh’s idea about a period comedy with 2 maids and turned it into Upstairs, Downstairs. He produced The Duchess of Duke Street and created and produced Danger UXB. To me, his name will always be connected to meticulous period drama detail and amazing script writing. The story is credited to Paul Finney but this is just a pen name. The original writer was asked for his name to be taken off the episode after he disagreed with some of the changes done at the draft script stage by Script Editor Michael Cox and John Hawkesworth. I don’t know who the original writer was on this episode. 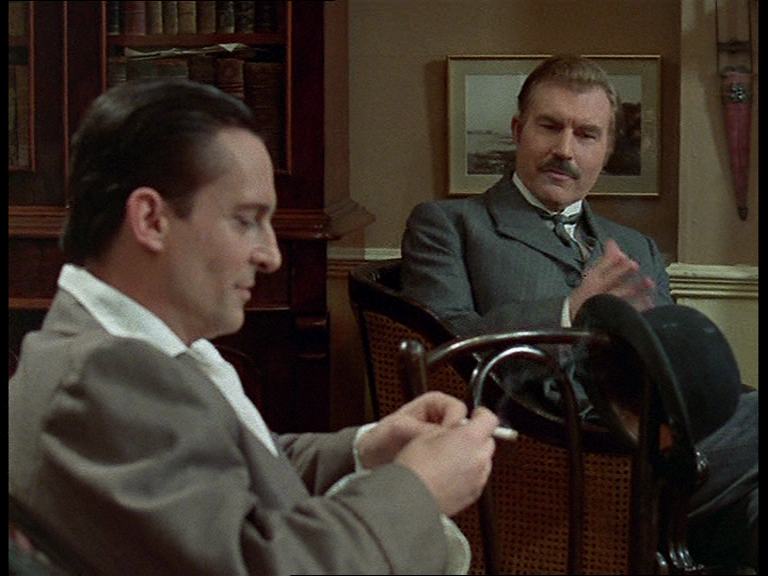 Of course there is Jeremy Brett. Jeremy Brett is energy. When he is on screen, one cannot help but be drawn towards his performance. That said, I don’t think he steals the show. He almost competes with the character he is playing. The character of Holmes is so larger than life that it needs someone of Brett’s caliber to play him or else it is not worth even trying. The character is perfect at everything but is flawed in many ways. His perfection is what makes him flawed. His mind is brilliant but he has addictions. I suppose it’s a bit cliché to say that Brett and Holmes are similar. It is probably also old hat to say that Brett succumbed to playing Holmes and that playing Holmes took over Brett. I saw some familiar faces in this episode. Rosalind Knight who played Countess Morcar, I’ve seen her in quite a bit of things including Carry on Nurse (1959), Mapp & Lucia (1986), Only Fools and Horses (1989). 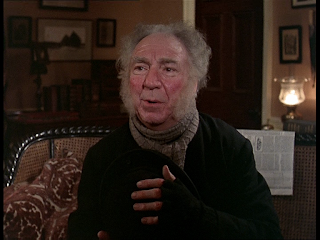 Brian Miller who played Inspector Bradstreet was married to the late Elisabeth Sladen. Frank Middlemass who played Henry Baker is probably best known for playing Rocky Hardcastle in As Time Goes By. I watched these episodes from the boxset that first included the re-mastered prints. They look stunning. I can only imagine how good they will look in HD. This will be an inevitable Blu Ray release. I know that HD masters have been prepared for re-broadcast on some channels. The series was shot on 35mm film. I had a friend once tell me he had seen an episode shown in school when he was a kid from 16mm film. That would have been cool to see. Especially since this was an American school. For years, the film prints seen were not transferred well and were always faded. With telecine technology vastly improving and continuing to improve plus the film being transferred from the negatives, these episodes look great. I have the whole series and there are no extras. It would have been nice to see the inclusion of the mini episode which made up part of The Four Oaks Mystery which in itself formed part of ITV’s Telethon 92 broadcast. Also, I get really annoyed when companies feel the need to replace logos. Why can’t we enjoy the series completely as it looked at the time? 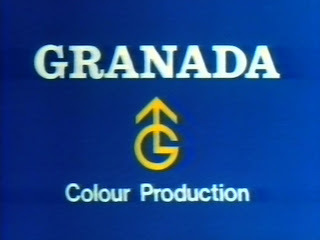 The episodes are missing the blue opening/closing card for Granada and only has a replaced CGI created one at the end of the episode. That said it is small nuisance for a beautiful DVD set of one of the greatest detectives of all time. Next week: comedy returns to Christmas as we look at two fun episodes of George & Mildred. Only one is an actual Christmas episode, we will watch The Mating Game & On the Second Day of Christmas. I just watched Sherlock Holmes Game of Shadows yesterday myself with a friend. After the film my friend's first comment was Rathbone and Brett would be turning in their graves over it. All I can say Ritchie made a film that took everything great about Sherlock out of it making me want to watch more Brett and Rathbone when I got out. It's an interesting question of whether a action-orientated Sherlock Holmes is better than no Sherlock Holmes at all? Does it get younger people interested in reading the books. I haven't seen the films myself but it almost seems like with some of the over the top sequences to the film that they are doing something similar as the Wild, Wild, West all those years ago. For me, Jeremy Brett was, is and always will be Sherlock Holmes. Full stop. End of story. It really is a shame that they got so close to completing the Holmes stories but were unable to finish them. Dave,the question is, if Brett had lived would they have finished? I always thought so too but it sounded like Brett was thinking of giving up the part. I suppose they could have done what they did with Suchet/Poirot and string it out. It's still hard to believe Jeremy Brett is gone. 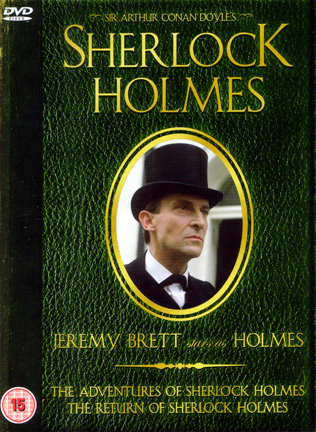 Jeremy Brett died in September 1995. It really does not feel like it has been 16 years already. Considering how many health problems he had from 1985 on, it really is amazing just how much work he did. We really are blessed with an amazing series that will forever be his legacy. Great article! Really enjoyed it. I'm a massive Sherlock Holmes fan. Last week I attended a Murder Mystery event at the Sherlock Holmes Hotel. It was great fun and they even based it on a Sherlock story! Thanks for the kind words. I will definitely check out your link! 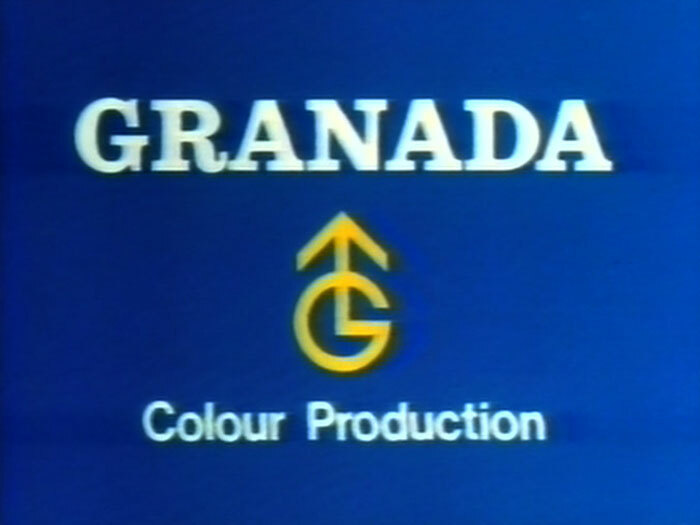 I don't think any of the Granada Sherlock Holmes episodes were shot on 35mm. The series made in 1984 certainly wasn't. I was on location with them during it and it was a Super 16mm camera.